There are a few different ways to patch holes, dents or scratches in wood, but oftentimes proper wood filler is not available. As most homes and buildings are sheathed with drywall, drywall mud is generally easier to find and a good substitute. Mixing up a batch of mud is quick and easy, but use it only if you are planning to paint the surface, as drywall mud dries to a white finish and will stand out against the color and tone of natural wood. Mix the drywall compound with some water in your bucket according to the ratio specified on the packaging of the compound. Stir the water and compound together until you obtain a thick, pastelike consistency. Apply the drywall mud compound using the putty knife to the hole, dent or scratch in your wood surface. Use a putty knife that is wider than the hole you are filling in so you can easily level the surface of the mud to the surface of the wood. Remove any excess mud that has spilled while it is still wet, using a damp cloth. Once the mud dries, it will be more difficult to remove. Allow the compound to dry overnight. Wrap a piece of fine grit (240) sandpaper around the flat side of a block of wood and sand the surface of the wood and mud over the repair site. Always sand wooden surfaces with the grain as opposed to against the grain, as this will produce fewer scratch marks. Check that the repair is smooth to the surface of the wood by running your hand over the site of the repair. If there are any high spots, keep sanding. If there are any low spots, repeat Step 2. Paint over the site of the repair. 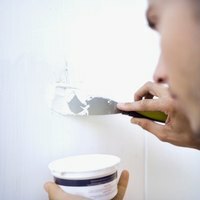 You may need to repaint the entire wall where the repair was made if the paint does not match perfectly. Some drywall mud compounds can be purchased ready to apply, saving you from having to mix it yourself. What Is the Difference Between Plaster of Paris & Drywall Mud?